Google just can’t catch a break with the Pixel 3. A Verizon promotional page suggests that the handset will start at a price of $799.99 for its 64GB model. If true, this would would make it $150 more expensive than the Pixel 2 was at launch. 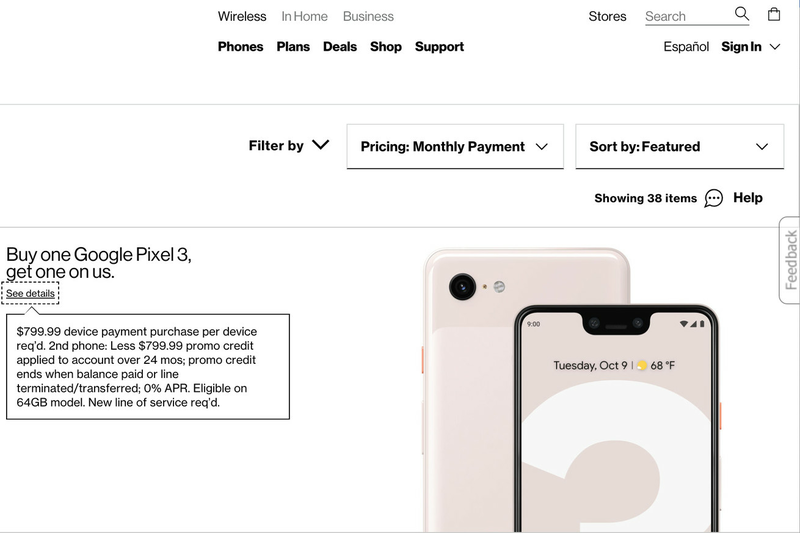 The deal advertises that consumers can get a second 64GB Pixel 3 for free with the purchase of one of the phones, with the $800 upfront cost of the free device being refunded over the course of a 24 month contract. The deal doesn’t always display on the Verizon Wireless site (we had to refresh a few times and use incognito mode). A closer look at the text of the Pixel 3 BoGo deal.